Will the US Fed Create More Inflation in Commodities? Inflation has been investors' main focus lately. A commonly held assumption is that the Fed's aggressive lowering of interest rates will only result in more inflation and an even bigger bulge in commodities prices. Is this a necessary outcome of increased liquidity and lower rates? First, the final “runaway” up-leg of the economic long-wave known as the K-Wave causes spiraling inflation. This occurred in the 1970s and early ‘80s in the U.S. Now, however, we're entering the final runaway deflationary period of the K-Wave. A repeat of ‘70s-style hyperinflation is therefore highly unlikely. The second way for inflation to rear its ugly head is in war time economies. War is probably the most expensive endeavor known to man. It always causes a rise in natural resource and basic commodity prices as materials are in high demand for waging war. In the early phases of a war, defense spending can lift the economy following a recession, as it did for the U.S. in 2002-2003. Commodity prices began their meteoric ascent in 2002-2003, around the time that the Greenspan Fed began vigorously loosening money and credit in response to the 2000-2001 recession. It would be easy to conclude that the inflation in money supply led directly to an inflation of hard asset prices, yet the story doesn't end there. The U.S.-led military actions in Afghanistan and Iraq were also key factors around this time. It was partly in response to the war-time measures earlier this decade that led to the commodities boom getting started. As we all know from history, during the early stages of a war, commodities prices tend to rally in the face of a dramatic increase in demand. 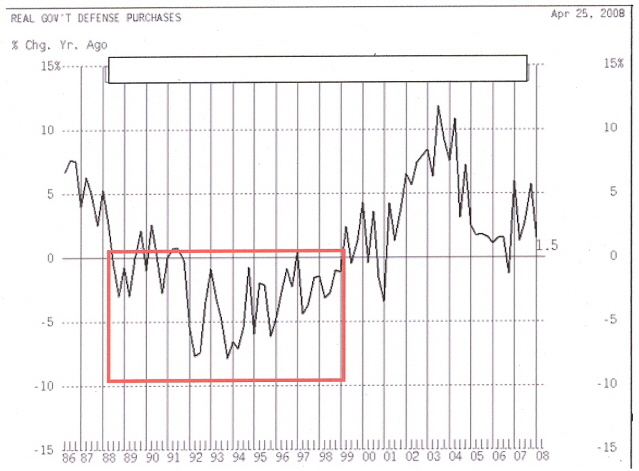 After an upward spike in 2001 following 9/11 and extending through 2003, defense spending has since waned, as the following chart shows (Source: Haysmarketfocus.com). Yes, war can create a huge spike in commodity prices. But can we blame the commodity price spirals we've seen since 2003 on the Middle East war. Certainly the ongoing military struggles in the Middle East, as challenging as they've been, can't be compared to the high-level wars of say Vietnam or World War II, which burned resources at a drastic rate. The reasons for the commodity price inflation lie elsewhere. This leads us to make the following statement: The most common “cause” for inflation is a weak economy. A weak economy, in turn, is a consequence of tight money measures by the Federal Reserve. The Fed holds ultimate sway over the fate of our national economy through its control of interest rates and money supply. Every major recession as well as every speculative bubble has had as its root in either a hyper-contractive or a hyper-expansive Fed monetary policy. The latest bout of economic weakness is no exception. It actually started back in 2004 when the Fed started tightening money and has now reached the critical point of “maximum recognition” where public awareness is widespread. Indeed, domestic price inflation was brought to us courtesy of the Fed's tight money policy. This flies in the face of conventional “wisdom” yet it's so patently obvious to anyone who ignores the talking heads and pays attention to the correlations. The bottom line is that we have gone through a period of economic contraction, and consequent stock market volatility and domestic price inflation, because of a tight money policy embraced by the Fed from 2004-2007. The tide has shifted, however, and now the Fed is embracing a much looser monetary policy. It will take a while for the full effects of this loose money policy to be felt in the overall economy. One thing is for certain, however, and it's that the newly embraced Fed's loose money policy will eventually do its work in galvanizing the economy and equities as it has always done in the past. This is one instance where history always repeats.